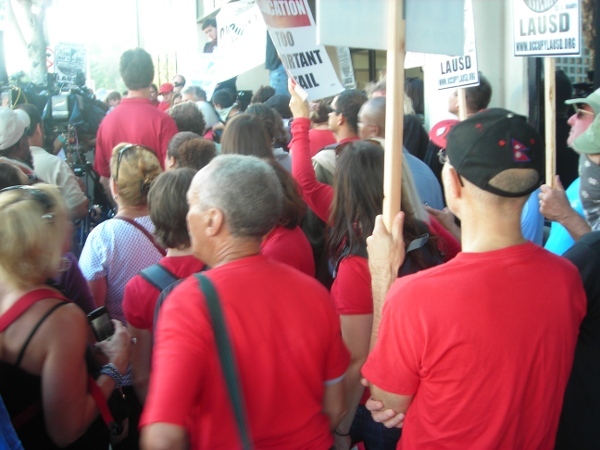 So I went to the UTLA thing, and it was good. This is a little rant about the media. So I went to the rally, and it was pretty good. Very spirited, and the anti-corporate message, I supported, which was why I was there. 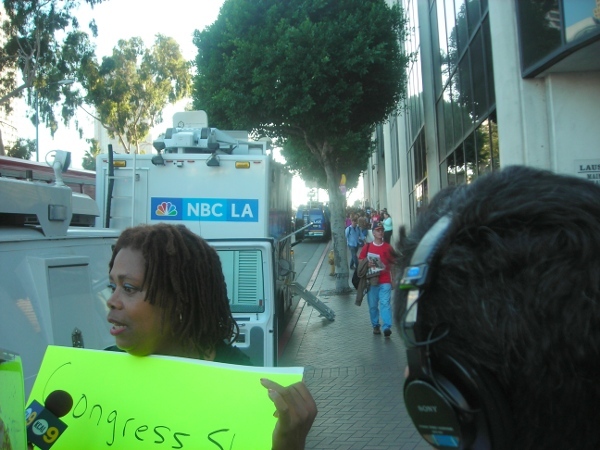 Down at the corner, this lady, Patricia McAllister, was standing with an anti-Jewish sign. She is the woman who got on reason.tv and Fox saying that the crisis is the fault of Zionist bankers, and we need to have Congress control the Fed. Now, it looks like the media want to give her more attention... while they kind of ignore the real protest which is happening up the street. They had coverage up there, but why waste resources on this person with a fringe racist message? And this was the protest. It was hard to count, but it was pretty big. They had a few talking points. Stop the corporate giveaway to charter schools. Stop with the RIFs and bring teachers back from layoffs. Reduce class sizes. Bring back support staff. And they were going to occupy the sidewalk.